On the ninth day of Christmas, my true love gave to me….a jet-setting friend. They hop from one place to another, filling up all the pages in their passport and their Instagrams with exotic locations. The wanderlust is as real as your friendship with this one. 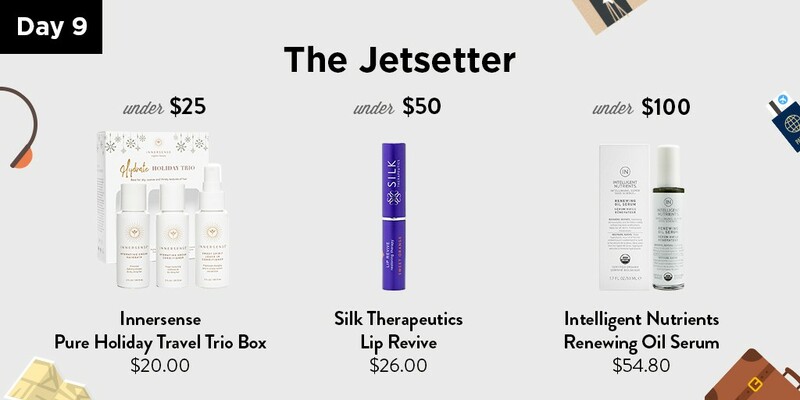 This holiday season we have the perfect non-toxic gifts she can take with her on next vacation. Tis the season for traveling and winter vacations. This is Traveling Trio by Innersense will be the only haircare item your jet-setting friend will need. While they trade the snow for the sun, this will ensure their locks stay hydrated and smooth no matter the destination. The Pure Harmony Hair Bath provides gentle cleansing to increase moisture with aloe extract, shea butter, pumpkin seed, and coconut oil. The Pure Inspiration Daily Conditioner provides detangling, smoothing, and strengthening with rice bran oil and aloe while orange flower oil gives a frizz-free shine. The Sweet Spirit Leave In Conditioner can be sprayed in to maintain body and manageability with emollient oils, herbs, and a touch of honey. While traveling you endure different temperatures and climates that leave your lips in despair. This moisturizing balm from Silk Therapeutics is packed with antioxidants to hydrate dry cracked lips. With only 10 ingredients in this balm such as liquid silk, vitamin E, and nourishing oils. It deeply replenishes lost moisture to give smooth hydrated lips. Your friend will love throwing this sleek, lip rescue in their travel bag on their next adventure. The perfect item to pack on their trip to ensure their skin stays clear no matter their destination. This serum is made with clean oils such as argan and acai as well as active essentials, it quenches dry skin, while finding balance with clear skin, brightens up dull skin and reduces redness. So no matter your friend's skin type or travel destination, this serum is light enough for hot weather yet still super hydrating for colder climates, making it a suitcase staple. Think Dirty’s 12 Days of Gifting: Day 9— The Jetsetter was originally published in Think Dirty on Medium, where people are continuing the conversation by highlighting and responding to this story.